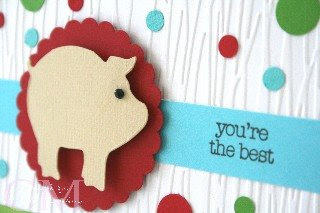 I've had this Sizzix little piggy die for awhile and even forgot that I had it. I was looking through my drawer for something else and came across it. And... I actually bought this from another store since J's didn't have it. I used the new woodgrain embossing folder for the background and punched out all those circles. Glued them all one by one. I have more cards to share and will be posting them each day. Thanks for stopping by and have a great evening! I just love this card, the colors are great together. have a nice weekend. This is cute card, I love how you used the circles on this card. 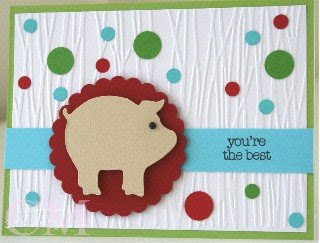 cute piggy card. Love the new CB folder!